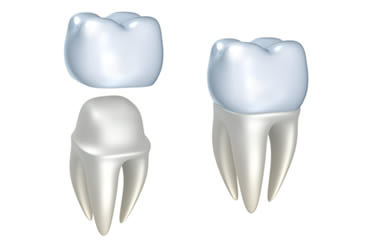 A dental crown is used by our Simi Valley dentist to restore a tooth that has been damaged. There are various types of dental crowns made of different materials; however, our dentist will help you choose which is right for you. Dental crowns are specially designed for every patient and are shaped to fit over the existing tooth, restoring its strength, size and appearance. How are dental crown placed? While visiting our dentist for a dental crown, expect the procedure to be relatively simple and non-invasive. Anesthesia will be used to completely numb the area for maximum comfort while the tooth is prepared for the dental crown. Depending on the type of dental crown used, a temporary crown may be placed while waiting for the permanent crown. Once ready, you will come back to our dental office and the permanent crown will be cemented into place. Our dentist focuses on preservative dentistry and will always attempt to keep your natural tooth following any damage. By placing a dental crown, the natural tooth is kept. If you need a dental crown or would like to schedule a visit with our dentist in Simi Valley, call us today. We look forward to providing you with a healthy, new tooth!